On the tram to baggage claim in Zurich’s airport, there’s the sound of cowbells. The blue notes of an Alpine horn. The image of a Heidi-lookalike winking through the window. Everything but chocolates, and those will soon appear on the pillow in your hotel room. Cheese follows, too. Along with those national icons, Switzerland has produced some lesser-known dramatic moments, too. Now’s a perfect time to trace them, as the country approaches the 500th anniversary of its unique religious reformation, on the heels of reforms in neighboring Germany. Huldrych Zwingli was Switzerland’s Martin Luther, albeit even more liberal in his thinking, and Zurich is the place to which this former Catholic priest was summoned by its businessmen and politicos back in the early 1500s to spread the message of reform he’d been widely preaching. They were fed up with the Catholic Church’s excesses, and quickly adopted Zwingli’s sweeping changes. Among them: Abolish sales of indulgences and the opulent clerical lifestyle they provided. No more artwork glorifying saints. Nor celibacy. Nor Latin (he, too, translated the Bible into laymen’s German). An end to ostentatious finery. Nein to excesses of alcohol and gambling. Begging was banned in favor of food and employment provided to the underclass. And the list goes on. Forget those altercations for an afternoon to wander the twisting alleys of Old Town, where a cache of avant-garde designers offer knitwear, jewelry, home design, and more. Hidden among their gables you’ll find Opfechammer—Apple Chamber— the oldest wine café in town, for rosti potatoes with bratwurst served on antique tables thickly carved with diners’ names of past centuries. Or head to Karl der Grosse, a working man’s lunch spot, to savor meatloaf or curry. Hitli stakes its claim as the oldest vegetarian restaurant in Europe (think 1898), but its lively setting is anything but antique. Join the buffet line to choose among 100 tasty treats, then linger weekends as it morphs into a music club. Primp for an elegant supper at Zunfthaus zur Waag, whose fourth-generation owner excels in classic local favorites, from veal to venison with spaetzle noodles. Stroll off the calories along neighboring Bahnhofstrasse, the Fifth Avenue of town. You’ll end up at the Swiss National Museum, whose fake-Gothic castle contains lodes of history. Kunsthaus Art Museum celebrates the masters, starting with Rodin’s Gates of Hell on to Rubens, Rembrandt, and Warhol, climaxing in two of Monet’s most pensive water lilies. The artists of tomorrow? Find them in happening Zurich West, hotbed of all things avant. Lovely Lucerne, an hour distant (the excellent-value Swiss Travel Pass allows unlimited travel by train, tram, bus, and boat), didn’t get the message. It remains a Catholic city, showcasing churches such as Hofkirche, an elegant Baroque beauty, and cozy St.-Peterskapelle, near the medieval Kornmarkt, its ancient walls brimming with historic frescoes. Spanning the river flowing into Lake Lucerne are two covered bridges, twin symbols of the city. Each boasts a series of 17th-century roof panels—one, detailing Swiss history (yup, there’s William Tell) and the other, a cautionary lesson led by a dancing skeleton. Paintings of a modern thrust are celebrated in Sammlung Rosengart, boasting an entire floor of Picassos, and upstairs, Chagall, Matisse, Miro, and more. The river tumbles into Lake Lucerne, where the newly launched MS Diamant offers boat tours—ours, supplemented by a traditional dinner feast called raclette. Diners DIY it by melting yummy cheese over a hill of boiled potatoes. 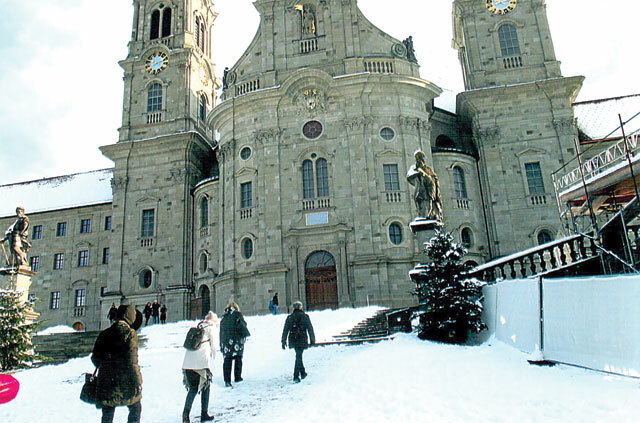 Pilgrims—either the pious, to visit the amazing Benedictine monastery, or athletic, keen to hike or ski the surrounding peaks—board trains for the hour’s jaunt to Einsiedeln, whose massive monastery dominates the tiny town. This breathtaking Baroque showpiece climaxes in a chapel dedicated to the famed Black Madonna, dressed for success in gilded couture. Daily its monks offer Gregorian chants, and in summer, weekly organ concerts (BTW, Zwingli served two years here before heading off to Zurich). The monks’ Rococo library clasps priceless tomes such as the illuminated parchment volume created right here in 950 A.D.
Another hour-long train ride leads to Engelberg, famed equally for its ski slopes and its own Baroque monastery, gloriously rebuilt in 1729 after its founding in 1120. Affable Brother Benedikt, 28, one of its 27 monks, joined us in a warming lunch—pea soup, pasta— before guiding us through another wondrous library, whose treasures include a volume from 850 A.D. and age-old graffiti of a preening monk. Intricate inlaid wood is the handiwork of another talented brother. In the ornate white and gold chapel, where Mendelssohn once played the organ, Brother Benedikt wakens the pipes for guests. The brothers also own the property’s cheese shop, where we’re met by a horse-drawn sleigh for a tour of the snow-kissed valley beneath the slopes. Hop the train to Basel, pinpointing the spot on the Rhine where Switzerland shares borders with Germany and France. Those neighbors swarm to Basel to work in its booming pharma industry and savor its vibrant art scene in the city known as the most free-thinking in the land. Erasmus, the liberal Dutch philosopher, published his translation of the New Testament here. Zionist Theodore Herzl stayed at its patrician Trois Rois Hotel, where in 1896 he staked his historic claim: “I founded the Jewish State here.” Napoleon stopped for lunch. So did Picasso. If they’d ventured across the bridge, they might have dined in homey Restaurant Fischerstube, once headquarters for a bygone fishermen’s guild. Or dipped bread into melted cheese at Restaurant Kunsthalle Fondue Stubli. Today it’s world-renowned starchitects who’ve put their stamp on the city: Heurzog & de Meuron, Renzo Piano, and Frank Gehry, to name-drop a few. Basel’s renowned Kunstmuseum showcases contempo masters as well as a stellar collection of Holbein paintings and a retrospective of Marc Chagall, who adopted Basel as his home. The H & de M crew also put their stamp on Volkshaus Basel, a smart bistro which soothed jetlag with pate and osso buco. Ride Tram 6 to the end of the line to discover the heart-thumping Fondation Beyeler, home of modernists from Warhol to Picasso, Giacometti to Klee, in architect Piano’s lush setting flecked with water lilies (Monet’s are inside). Back in the historical center, the pink-stone Rathaus (Town Hall) sports overweight cherubs frolicking on its façade facing the buzzing Marktplatz, while up the hill rises the Munster, Basel’s 13th-century cathedral, where Erasmus lies entombed. Stroll along the riverbank to the Papiermuseum, occupying a medieval mill where paper was once made, and still is. After viewing the evolution of the process, visitors are invited to produce their own. When to visit? During Basel’s famous Art Fair. In December, when Christmas markets glimmer. Or any time you’re in need of Swiss bliss. For info, visit www.MySwitzerland.com.